Rawa Idli is a speciality of the state of Karnataka and was invented by the popular restaurant chain, Mavalli Tiffin Rooms (MTR) when during World War II, when rice was in short supply, MTR experimented in making idli using Rawa and hence Rawa idli was invented. Lightly roasted rawa/semolina with a seasoning of mustard seeds, green chillies and ginger which is whisked with a mixture of yogurt/curd is ready to be steamed. Unlike traditional idlis, which takes almost a day for preparation of the batter, these rawa based puffed idli hardly needs preparation and can be made in a jiffy. This is one of the quick recipe I enjoy preparing when I have unexpected guests. Rawa Idli with Thengai/coconut chutney & Vengaya chutney. 2 tablespoons finely chopped coriander leaves. Heat a tablespoons oil and fry the rawa for about 5 minutes and keep aside. Heat a tablespoon of clarified butter/ ghee, fry the cashewnuts till golden. Set aside. In a large mixing bowl mix the rawa/semolina, ginger, chilies, coriander leaves, curds, baking soda and salt, using very little water. The batter should be thick and of pouring consistency. Heat the remaining oil and add mustard for seasoning. When the mustard seeds, splutter, add curry leaves and asafoetida and mix well into the the batter. Let the batter sit for 30 minutes. After 30 minutes check the consistency of the batter. If it is too thick add some more water to bring it to the idli batter consistency. Finally add the fried cashewnuts. Pour the rava batter into idli plates and steam the idlis for about 10 minutes. Remove the rawa idlis, add a dash of ghee on top of Rava Idli and serve hot with chutney or sambar. Tips: Grated coconut, carrots and spices of your choice can be added to the batter before steaming. First time here, from bloggerAid.. Yummy blog! You can add a followers gadget as visitors like me can follow your posts regularly! Will visit again..
Oh Yes! I fell in love with these in Bangalore, MTR!!! YUM! Gorgeous Idlis I must say!!! Yes,I too love this,long time I was using MTR,now a days i too started making at home,urs looks great! Delicious Rawa idly.. nice click.. looks perfect & soft.. They look perfect Cilantro. The chutneys look fantastic as well. WOww soft and fluffy rawa idlis looks marvellous Cilantro! My daughter liked the pic, she loves these! Looks good! first time at your blog...nice work. 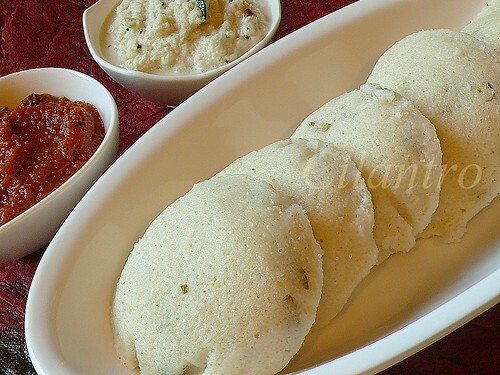 these idli looks gr8t ! Idlis look soft and spongy! Idlis looks soft and tempting..... Nice picture. Idli looks really good in the picture. I like the Chatnis that are being served with the Idli in the restaurants. THANK YOU, NICE RECIEPE, FIRST TIME CAME TO KNOW FULL FORM OF "MTR", WE WERE USING MTR SAMBAR MASALA & RAWA IDLI MIX SINCE MORE THAN DECADE. I APPRICIATE FOR HAVING GOOD AUTHENTIC SOUTH INDIAN RECEIPES, WITH COMMENTS AND TIPS. . . . THANKS FOR NICE EFFORT, MUST SAY GOOD PHOTOS.